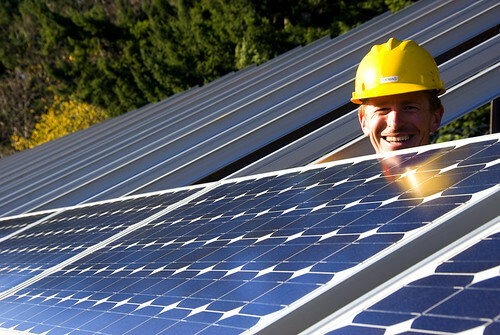 Solar is a big employer in the US – bigger than coal, new data shows. Photo by OregonDOT on Flickr. Fascinating read; the ethics of publicly calling out peoples’ errors is upsetting scientists. The smartphone’s image sensor, in particular, is becoming a universal input, and a universal sensor. Talking about ‘cameras’ taking ‘photos’ misses the point here: the sensor can capture something that looks like the prints you got with a 35mm camera, but what else? Using a smartphone camera just to take and send photos is like printing out emails – you’re using a new tool to fit into old forms. In that light, simple toys like Snapchat’s lenses or stories are not so much fun little product features to copy as basic experiments in using the sensor and screen as a single unified input, and in creating quite new kinds of content. Meanwhile, the emergence of machine-learning-based image recognition means that the image sensor can act as input in a more fundamental way – translation is now an imaging use case, for example, and so is maths. Here it’s the phone that’s looking at the image, not the user. Lots more things will turn out to be ‘camera’ use cases that aren’t obvious today: computers have always been able to read text, but they could never read images before. When this becomes continually true, what changes? When your phone knows what it’s seeing, what can it do? Google is probably pretty pissed off. An alleged Russian spammer recently used a domain strikingly similar to Google.com to flood websites’ analytics with unwanted pro-Trump messages, and Google is now trying to wrest control of the URL. But Vitaly Popov, the site’s owner, is not giving up without a fight, no matter how unlikely he is to win. Late last month, Google filed a complaint with an arbitration forum over Vitaly’s ɢoogle.com domain. As you might notice, the “G” in ɢoogle.com looks a little off. That’s because Popov registered the website back in March 2016 with the Latin version of the letter, meaning he can produce a URL that looks very similar to Google.com, but that sends visitors elsewhere. Popov has done the same for the “K” in lifehacĸer.com. “Google requests that the Panel issue a decision that the Domain Name registration be transferred to Google,” the company’s complaint, provided to Motherboard by Popov, reads. (A member of the arbitration forum, called ADR Forum, confirmed that there was an ongoing dispute between Google and Popov). In its complaint, Google claims that Popov’s phony domain redirects visitors to a landing page with a slew of dodgy pop-ups, including one that asks for a Windows username and password. Spam has moved on a bit. the narrative around Apple Watch was so lost that when Google delayed Android Wear 2, vendors like Motorola/Lenovo exited the market, and Pebble sold itself off, hot takes tripped over each other claiming the “smartwatch market” might be dead. Fitbit, which makes a wide range of fitness-focused wearables, also didn’t face the same kind of pessimism from the tech community. Indeed, they were promoted as incredibly popular and far more flexible thanks to their greater diversity of styles and price-points. Yet their last quarter painted a very different picture. It could be that there is no real “Smartwatch market”, just an Apple Watch market. Much like there’s no real “tablet market”, just an iPad market. Since it’s such a new product category and most of the existing products are still bound to phones, it could also simply be too soon to tell. I don’t see Android Wear 2 making any difference to this dynamic, and I don’t see Fitbit’s attempts to escape into the smartwatch space being a huge success. Web traffic from desktop computers plummets on weekends as people spend most of their time on mobile once they leave the office on Fridays, according to a Parse.ly study. The ratio of mobile to desktop traffic stays somewhere near 1:1 throughout the week, but on weekends, the ratio changes dramatically — nearing closer to 2:1. Check out the grey dips in the chart below. Parse.ly estimates that this change accelerated most from 2015-2016. Their findings also show that the mobile ratio tends to increase late at night, even supporting an 11:00 p.m. EST “reading activity peak” for mobile visitors. Speaks to the importance of office PCs for use of sites like Facebook and online shopping. when it comes to spotting and orienting bikes and bicyclists, performance drops significantly. Deep3DBox is among the best, yet it spots only 74% of bikes in the benchmarking test. And though it can orient over 88% of the cars in the test images, it scores just 59% for the bikes. Košecká says commercial systems are delivering better results as developers gather massive proprietary datasets of road images with which to train their systems. And she says most demonstration vehicles augment their visual processing with laser-scanning (ie lidar) imagery and radar sensing, which help recognize bikes and their relative position even if they can’t help determine their orientation. Further strides, meanwhile, are coming via high-definition maps such as Israel-based Mobileye’s Road Experience Management system. These maps offer computer vision algorithms a head start in identifying bikes, which stand out as anomalies from pre-recorded street views. Ford Motor says “highly detailed 3D maps” are at the core of the 70 self-driving test cars that it plans to have driving on roads this year. How long before the first bicycle knockover? The holiday quarter of 2016 capped off another positive year of smartphone growth despite concerns about the overall market slowing. According to preliminary data from the International Data Corporation (IDC) Worldwide Quarterly Mobile Phone Tracker, smartphone vendors shipped a total of 428.5m units during the fourth quarter of 2016 (4Q16), resulting in 6.9% growth when compared to the 400.7m units shipped in the final quarter of 2015. For the full year, the worldwide smartphone market saw a total of 1.47bn units shipped, marking the highest year of shipments on record, yet up only 2.3% from the 1.44bn units shipped in 2015. Large markets like China, the United States, and Brazil all ended the year on a strong note helping to keep worldwide volumes in positive territory. Apple beating Samsung is surprising – suggests that the Note 7 debacle really did hurt sales. Meanwhile, it’s Apple, Samsung, and then Huawei, OPPO and vivo – three Chinese makers taking 23% share. The “others” are being squeezed, down from 46% to 40%. Last week HTC lost its VP of Design to Google. This week, the company’s Global Executive Vice President has also departed. Jason Mackenzie yesterday announced that he is leaving the company after nearly 12 years. The executive did not give a reason for his departure, nor does he know where he’s heading next, as one tweet reveals. We’ve reached out to HTC to ask why he left the role and who the company plans to replace him with. Good luck with getting an answer. I doubt HTC itself knows. He also talked about China being transformed into “one of the world’s leading music markets” thanks to local streaming services, and perhaps global players. “In the next ten years, China may well become the world’s largest recorded-music market,” he said, talking of the potential for a cultural knock-on effect that “rivals the 1960s in the west”. He reiterated Universal’s support for both free and paid models in the streaming world. “The truth is, as these swells continue to propagate, we don’t know how far paid streaming will go,” he said, while arguing that it must offer features over and above free rivals to create value. That “two of the top five.. on other peoples’ money” sounds like Spotify and Deezer to me. In the United States, more people were employed in solar power last year than in generating electricity through coal, gas and oil energy combined. According to a new report from the U.S. Department of Energy, solar power employed 43% of the Electric Power Generation sector’s workforce in 2016, while fossil fuels combined accounted for just 22%. It’s a welcome statistic for those seeking to refute Donald Trump’s assertion that green energy projects are bad news for the American economy. Just under 374,000 people were employed in solar energy, according to the report, while coal, gas and oil power generation combined had a workforce of slightly more than 187,000. The boom in the country’s solar workforce can be attributed to construction work associated with expanding generation capacity. “The 2017 U.S. Energy and Employment Report (USEER) finds that the Traditional Energy and Energy Efficiency sectors today employ approximately 6.4 million Americans. These sectors increased in 2016 by just under 5 percent, adding over 300,000 net new jobs, roughly 14% of all those created in the country. Yep a subset, since the “traditional” energy sector employs 6.4M. I’m guessing that the subset correlates with the construction build-out of solar, so that the solar numbers must have been larger in 2015 and 2014 and probably a few more years back in time. So, not really new news. Did Obama put the solar panels back? The ones that Reagan removed that Carter had installed? I doubt Trump is opposed to solar, he wants energy independence. He should be energy type agnostic as long as it’s locally-sourced, right?